Unlike many of my food-loving peers, I don't belong to a CSA. (I know, you're as shocked as when we found out that Khaleesi speaks Old Valyrian. (Obligatory Game of Thrones reference.) I'd love to really delve into this topic with a psychologist, but the short of it is that the idea of committing to a lot of random produce feels stressful to me. I'd much prefer to do small grocery shops every other day. That said, for the second time in a few months, I've been in charge of someone else's CSA box, and I think I'm beginning to change my tune. Partially because of these adorable dried pinto beans I picked up this week. 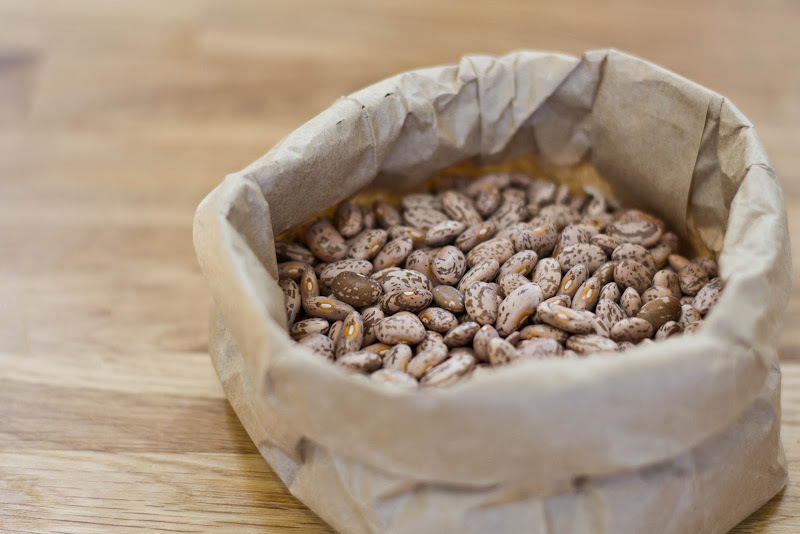 About three years ago, I made some slow-simmered pinto beans that were just OK. With three more years of cooking under my belt, I knew I could do better this time around. And when I found a recipe that called for lard and queso Oaxaca, I was sold. When I first began to cook, anything that called for lard was a major turn off, but now I know to hang on to that leftover fat from cooking bacon and voilà: lard. As for the Oaxacan cheese, there's this store called El Rancho market very close to where I live that I'd been told has really good queso fresco. Surely, they would have queso Oaxaca, no? 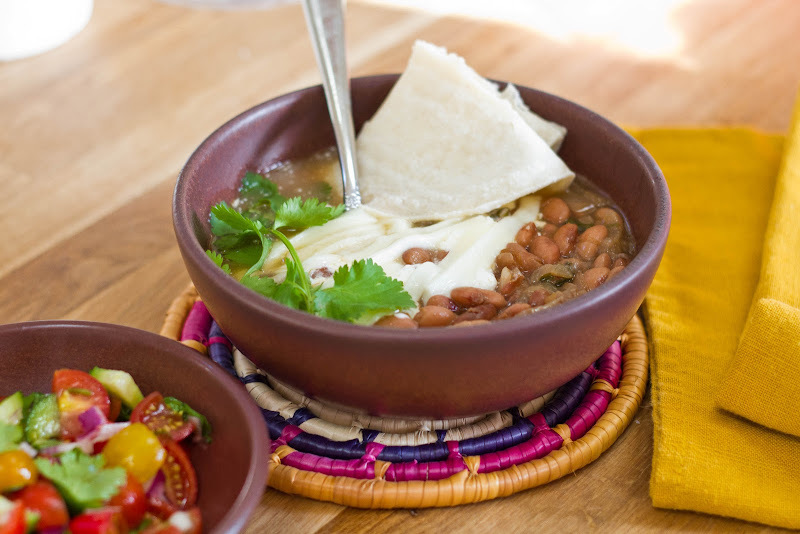 I substituted with canola oil and tweaked the original recipe a bit, adding garlic, a tomato, cilantro, and two jalapeno peppers, to make sure my beans would be flavorful. And, bingo again, because they absolutely were. This has got to be my favorite way to cook: throw a bunch of ingredients in a pot and let them simmer away for a few hours until it has transformed into something delicious. This meal also represents my favorite way to eat: something hot and comforting paired with something fresh and citrusy, all served with a few tortillas. And speaking of favorites, Matt took me to one of the sessions of the NCAA gymnastics championships, which were held this past weekend at UCLA, and uhm, I had a lot of fun. (And I think so did all the other 13- and 14-year-old girls I was sitting by.) Matt, on the other hand, well, he had fun at the Stanley Kubrick exhibit we went to at LACMA afterwards. So, all in all, a totally normal day! 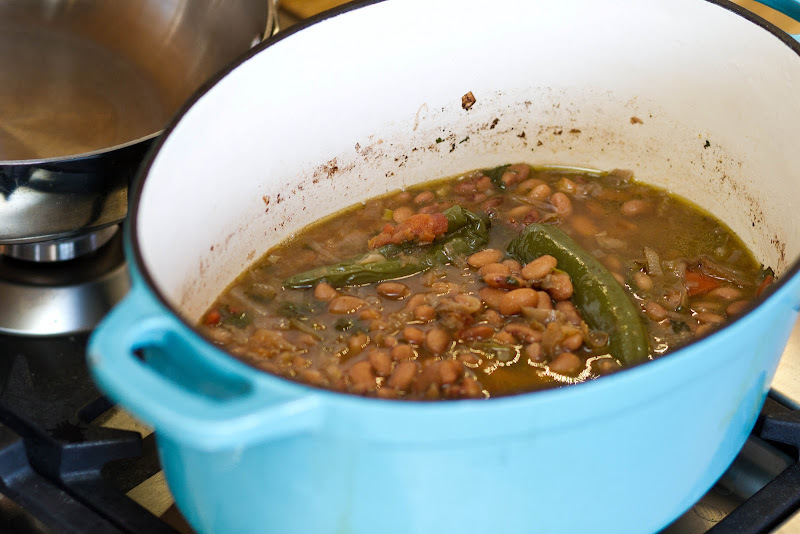 Bring beans, onion, lard, tomato, garlic, cilantro, jalapenos, a tablespoon of salt, and 8 cups warm water to a boil in a 4-qt. saucepan over medium-high heat. Reduce heat to medium-low, and cook, covered and stirring occasionally, until beans are just tender and begin to split open, about 2 hours. Taste. Add salt if necessary and continue cooking, mashing some of the beans in the pot as they cook, until beans are completely soft, about 30 minutes more. 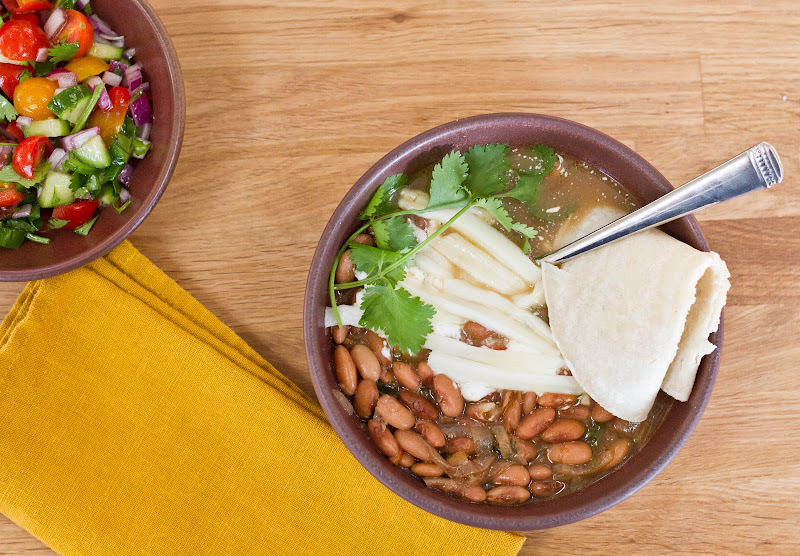 To serve, ladle beans into serving bowls and garnish with a spoonful of crema and some of the cheese. 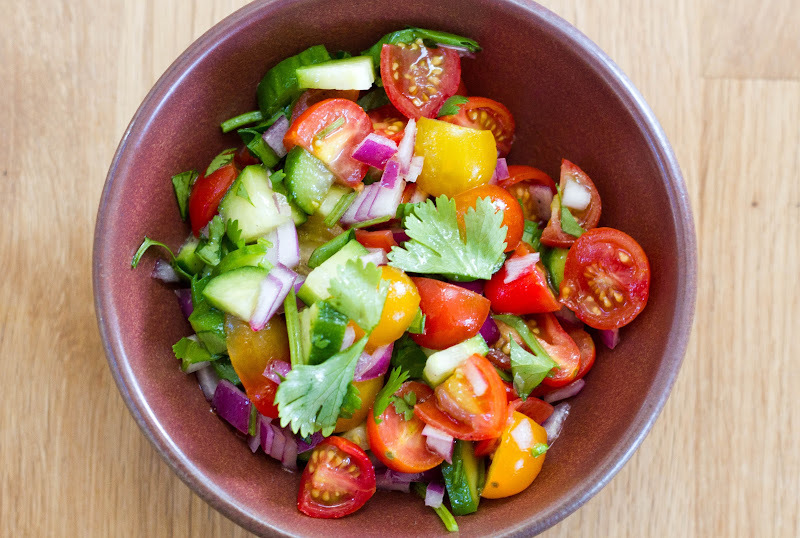 Serve with pico de gallo and tortillas. Kubrick exhibit > Gymnastics finals. There, I said it. Oh dang! I totally want this! And unlike you, I do have a jar of lard in my fridge! Did you soak your beans overnight first, or just bam, straight into the pot? no need to soak 'em! I am definitely going to have to try this, since last time I was soaking beans, my 3 year old dumped the bowl of beans and water on his head. So, no soaking -- I'm sold! The only thing better than string cheese is "giant string cheese". I would have LOVED the Kubrick exhibit just for The Shining! Hehe. The beans look awesome but I agree bacon fat would have made them even more amazing. Your "normal" day sounds like a blast... Your combo of photos cracks me up, too. And... I'm with you on the csa -- too much pressure! I always here that adding salt to dried beans makes them crunchy, is that true? HIGH FIVE on this one, yo. These beans are out of this world! I soaked the pintos overnight and then put them in a crock pot with the onions, garlic, a jalapeno cut in half and the other aromatics (including the salt). Eight hours later they were perfection- soft and creamy but still toothsome. Served with cheese, fresh made salsa, corn tortillas and slaw. Thanks for sharing! Niiiice! And I know! I love a cheap, delicious meal! Spring suddenly reverted back to winter so I wanted to make something warm and comforting. The beans have been simmering on the stove most of the day and I just did the final taste test. Yum!